When you have a need to reinstall your Windows 10 operating system, you may be wondering: Windows 10 reset VS clean install VS fresh start, which one to choose for the reinstallation? Here, this post will show you the difference and you can choose a proper one to use. Your Windows 10 PC may fail to work due to many problems caused by system file corruption, system settings changes, third-party software, malware, etc. To let your PC work normally, some of you may choose to reinstall the operating system since you may think it is annoying to troubleshoot and you may not solve issues eventually. 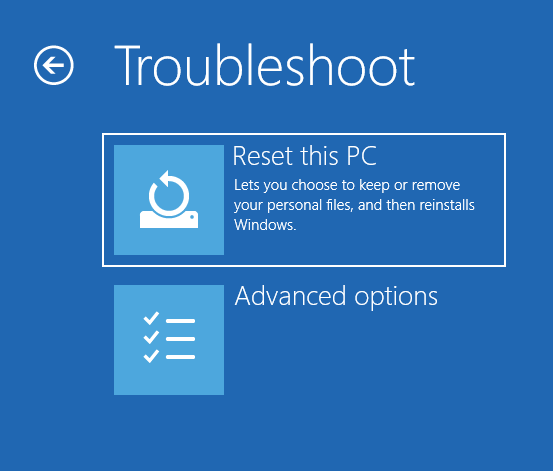 Reset This PC is a repair tool for serious system problems and it is available from the Troubleshoot menu or the Recovery page in Windows 10 Settings. If your PC cannot run properly, resetting your PC may solve issues without requiring the internet connection to work. The feature offers you two options to reinstall OS: keep the personal files and remove everything. The first option removes all installed software and apps, resets all Windows settings, but personal files including documents, music, and more are not removed. The second option is much like a factory reset since it will delete everything including installed programs, apps, settings, personal files, etc. Basically, the Fresh start feature helps to start fresh with a clean and up-to-date installation of Windows 10 but it can leave your data intact. In other words, this will keep your personal files, some Windows settings, and remove most of your apps. Then, install a fresh copy of the most recent version of Windows 10 by downloading from the Microsoft website. This refers to reinstalling Windows 10 by downloading the latest Windows 10 installation ISO file from Microsoft website and burning it to a USB drive or CD/DVD disc. And it offers you a fresh system without any hidden corruptions or problems. In other words, all information including apps, settings and personal files on system partitions are deleted and you will reinstall the system from scratch. After learning so much information, you may ask what’s the difference between reset and clean install Windows 10. Let’s see the following contents. When you do a clean install, you remove the previous version of Windows and replace it with Windows 10. The crucial thing is that your hard drive is erased (not the entire disk) - that's how the existing operating system is removed. Technically, the partition containing the OS is erased. 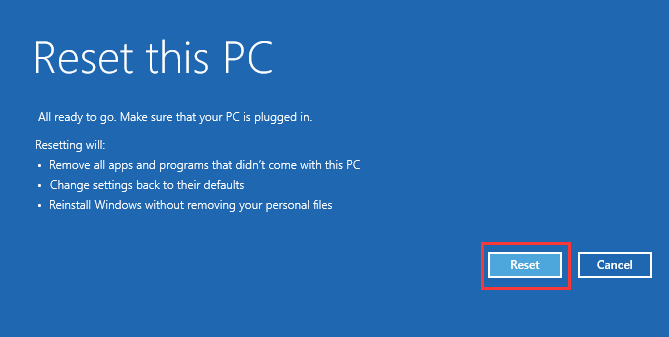 The Remove everything option of PC resetting is like a regular clean install and your hard drive is erased and a fresh copy of Windows is installed. But by contrast, a system reset is faster and more convenient. And a clean install must require an installation disc or USB drive. 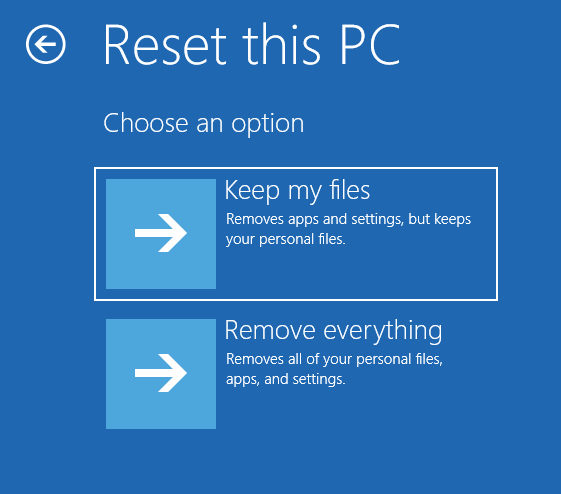 Reset this PC (Remove everything option) will delete all apps, personal files, and Windows settings. But Fresh start can keep your personal files and some settings. Besides, it will remove most of the apps but any store apps installed by your manufacturer will also be kept and the device will be updated to the latest version of Windows. Importantly, if your PC fails to boot, you can reset it in Windows Recovery Environment (WinRE) but there is no option Fresh start in the recovery environment. Both of them can install the latest version of Windows 10. However, there is a difference: Fresh start can keep personal files, settings, and some apps but clean install means everything will be deleted and it’s really a full clean install. If your PC cannot boot up, fresh reset is not useful. Here, you can choose to reset your PC or perform a clean install. If you have an installation disc, a clean install is a good way to completely solve the system issues. If you don’t want to create bootable USB drive from ISO file for clean install, please reset the PC in WinRE. To keep PC data safe, you had better make a backup for your personal files and programs to avoid data loss and re-downloading apps. To do this, you can use a piece of professional file backup software and here we highly recommend using MiniTool ShadowMaker. As reliable and professional backup software for Windows 10, this tool enables you to back up files, installation programs, Windows operating system, partitions, and the entire hard drive. In the backup process, the backup source will be compressed into an image file. Besides, it can help you to sync files to another location to keep data safe. Importantly, MiniTool ShadowMaker offers a feature named Media Builder, allowing you to create a bootable USB disk/drive or CD/DVD disc and then boot the PC to start backup and recovery in case of system breakdown. Check out the step-by-step tutorials on how to back up files without booting Windows 10. From the part Reset This PC VS Fresh Start VS Clean Install, you know the option can be found in Settings or the Troubleshoot menu. Here, we will show you how to reset your PC in Windows Recovery Environment. Step 1: In the event that PC cannot start up, you can restart Windows 10 several times and it may go to WinRE automatically. Then, go to Choose an option > Troubleshoot > Reset this PC. Step 2: Choose an option for PC resetting. In order to keep your personal files, here we choose the first option. Step 3: Choose an account, type the password and click the Reset button. Then, Windows 10 will start to remove all apps and programs that don’t come with the PC, change settings back to defaults and reinstall Windows 10 without removing your personal files. How to install Windows 10 via a Windows installation disc or drive? Step 1: To make a clean installation of Windows 10, you need to download Media Creation Tool from Microsoft Website. Then, use this tool to create a USB boot disk from ISO file. Step 2: Next, change the boot order in BIOS to boot your PC from this drive to reinstall your operating system. Please specify the language, time and currency format and keyboard. Step 3: Click Install Now to continue. Step 4: Your copy of Windows will be automatically activated later. Here choose I don’t have a product key. Step 5: Select the operating system you want to install. Step 6: Accept the license terms. Then, choose the type of installation. Here, your attempt is to make a clean install, so choose the second option. Step 7: Next, decide where you want to install Windows. Here, please choose the partition with the current installation of Windows. Step 8: Now, Windows Setup is installing Windows. Please wait patiently. After finishing the operations, you need to follow the instructions to configure some settings.